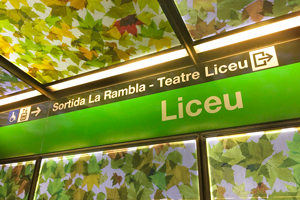 In this article, you will find all the information you'll need about Barcelona's Metro: timetables, maps, stops and useful advice about one of the most efficient means of transport in the city. In fact, getting around the capital of Catalonia shouldn't be a problem for any tourist thanks to the wide choice of different means of public transport and the vast number of stops. However, without any doubt, the fastest option is the Metro. Nevertheless, there are a few destinations where it would be advisable to opt for a different means of transport and we will cover these in the following paragraphs. Those who live in Barcelona know only too well that it is not advistable to stop at the larger stations such as Diagonal or Passeig De Gracia where, in order to make your required changes, or simply to reach the exits, you can spend a lot of time queuing or getting caught up in a mass of other travellers. Another useful piece of advice is not to take the Metro to visit Park Güell and Montjuïc Castle. In fact, by choosing to go to these destinations by bus, you will arrive much closer to the entrance at both attractions and also avoid a horrendous climb! Which ticket to buy? How much do they cost? First of all, it is worth knowing that the same tickets are used for the metro and for the buses. They can be easily purchased at the ticket dispensers at the entry to the Metro and the prices vary depending on the zones. In general, for tourists, buying a ticket or pass for Zone A should be sufficient (although this does exclude the airport). Buying a single ticket is not recommended as this is quite expensive at €2.20 (Zone A). Because of this, it is preferable to purchase a T10 Pass (i.e., 10 trips within Zone A) at €10.20. In addition to this, the Passes are not user specific so you can easily share them amongst your family and friends. The Line L9S on the Metro connects the centre of Barcelona with both terminals at El Prat Airport. The ticket costs €4.50 per trip which isn't very convenient unless you are heading to the University Area and Para.lel or betweeen Torassa and Glories. In fact, for those who prefer to travel to the airport as comfortably as possible, we would recommend booking a private taxi service: Taxi Barcelona, thus avoiding the stresses of using public transport when you're laden with heavy suitcases. For further information about the stops on the Metro Line 9, have a look at the following page: How to get from El Prat Airport to Barcelona. The timetables for the Metro tend to vary depending on the Line but in general, the service starts to operate from 05:30 and runs until midnight during the week. However, at the weekends, the service runs until 02:00 on Fridays and throughout the night on Saturdays. If you should need some means of transport outside the Metro's operating hours, you can always get a Night Bus or take a Public Taxi, which you can usually find quite easily on the street or which you can book by using the App.